1. If your motherboard chipset is 9 series of the following, do not use PM951, SM951, PM950 XP941 and other PCIe x4 specifications hard drive! 2. AMD chipset motherboard is not recommended to buy! 3. This product is inserted into the motherboard PCIE X4 or PCIE X8 or PCIE X16 slot, that is, the motherboard's graphics card slot, do not mistake insertion PCI slot, the error may burn the motherboard, adapter and your solid-state hard disk! 4.PCIE X4 transfer protocol M.2 NGFF solid-state hard drive is divided AHCI protocol and NVME protocol two, Windows 7 can not recognize the NVME protocol solid-state hard drive, this is particularly important! 5.This adapter only changes the interface shape, that is, from your original hard disk interface at the signal line out, into another interface shape, this conversion does not need to go through the integrated circuit chip, since not through the integrated circuit chip, so your hard drive The speed of performance and so did not have any impact, do not need any driver (the operating system to load your hard drive drive on the line, do not drive the adapter card, because there is no chip). The overall speed depends on how fast your hard drive, your computer can support how fast (many computer upgrades BIOS can improve a lot of speed). 6. Please make sure to understand your SSD transfer protocol, mismatch is not available. 7. It is important to note that the notch position of the card slot matches your SSD! 8. This product requires a higher level of professional users, non-professionals do not recommend buying / or suggest that you learn more about the relevant information before buying. The adapter for the interface to the interface conversion, without going through any chip, does not affect the performance of the hard disk. This adapter only supports M.2 NGFF interface, which is the PCIe x4 transfer protocol SSD and PCIEx 2 transfer protocol SSD (make sure to understand the hard disk transfer protocol, buy the wrong is not used). 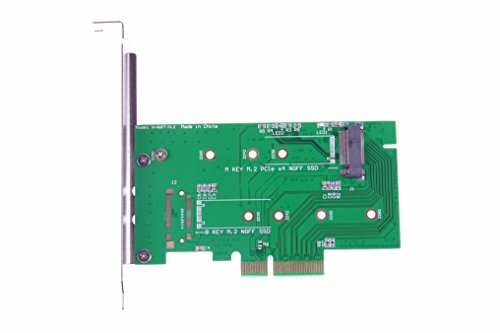 This product is inserted into the motherboard PCIE X4 or PCIE X8 or PCIE X16 slot, which is the motherboard's graphics card slot, do not mistake insertion PCI slot, the error may damage the motherboard, adapter and your SSD! PCI-E NGFF interface SSD through the computer's PCI-EX4 or X8 or X16 interface transfer, Is it possible do the system boot disk depends on your computer motherboard, with the adapter does not matter. PCIE X4 transfer protocol M.2 NGFF solid-state hard drive is divided AHCI protocol and NVME protocol two, Windows 7 can not recognize the NVME protocol solid-state hard drive, which requires special attention!